From fun tips and facts to insights from industry experts: we’ll make sure you’re set up for success this Mother’s Day with our top recommendations. Did you know: we’ve been dedicating a day to Mum’s for over 103 years! Perhaps unsurprisingly, according to Mintel (2017) research; the day remains the most purchased for event in the UK retail calendar (after Christmas) with “a greater number of consumers spending money on Mother’s Day than on the other events like Easter, Valentine’s Day and Father’s Day”. Whilst the average spending has remained relatively flat in recent years, the opportunities for retailers to encourage greater spending are still rife! And that’s where we’re here to help. Mum really is the word, so plaster it across your stores, doors and windows. Make it known you’re set up and ready to sell. Window displays are a wonderful way to grab attention from the outside, and will help to drive consumers through the door. You can create bespoke lettering displays with adhesive vinyls or window stickers; or even use personalised products such as our Letter Lightboxes; which you can stock and sell individually or as a set; and combine in any way you like to form words. Polaroid Photo Frames, are also fabulous for displays, allowing customers to personalise with their own memories. And even novelty ‘Mum’ gifts, like this Mumtastic Keyring from Happy Jackson, make great display props. Crucially, make sure you’re set up online too. Introduce additional sales channels, if you have the means, such as eCommerce sites. And if you already have that covered – expand your reach on social media channels like Instagram and Facebook. Last but by no means least: Offers! Take your pick from: “Buy One Get One Free”; % reductions, “Spend X and receive a free X”. They’re all quick wins for Mother’s Day; and will help you sell, sell, sell! It will probably come as no surprise that flowers are now the most popular gift option – stealing the top spot from greetings cards in 2016. Although true, it seems a sizeable proportion of buyers are leaning more towards experiential gifts, such as special food to have at home, or a trip away. According to Mintel (2017) “People are increasingly prioritising leisure as opposed to physical products when spending their disposable income”. And as a result, many retailers are using experiential promotions and events to attract shoppers in their stores. Why not bump flowers out for house plants or horticultural gifts which can be gifted together; and offer a more engaging experience for those green fingered than a bunch of flowers. Sure – flowers are fabulous; but plants are permanent! We recommend stocking up on the covetable range of Gardening products from Irish Fashion Designer, Orla Kiely. The Hanging Pots will make a delightful gift for Mum’s, as well as looking great on display, too. And the ‘Grow Your Own’ plant pot sets are a fabulous way to say they care. Play on the marketing messages you find around horticulture, and watch your profits grow! In-store events can really pay off, too. If you want to make a day of it, you have to offer more than just product. Why not ask a calligrapher to come and create bespoke gift labels for your customers; or set up ‘VIP’ shopping nights with exclusive offers and treats? Be as unique and as innovative as you can. Provide an experience – one that other shops can’t! Another way to encourage greater spending is of course, through upsell! Hone in on what you know sells in your store, and watch the uplift. POS units are fabulous for this, e.g. our range of Folklore Lip Balms, Hand Creams and Nail Lacquers, are all neatly displayed in cardboard POS units. And if you can stock gift wrapping and bags, too, you position yourself as a “one-stop” shop: why go anywhere else? Of course, many consumers are now heading to supermarkets for gifts; likely to be driven by both convenience and price, but also by typically longer opening hours. However, according to the Mintel (2017) report, “product quality is the driving factor for most people”, giving retailers opportunity to encourage people to upscale with premium ranges. 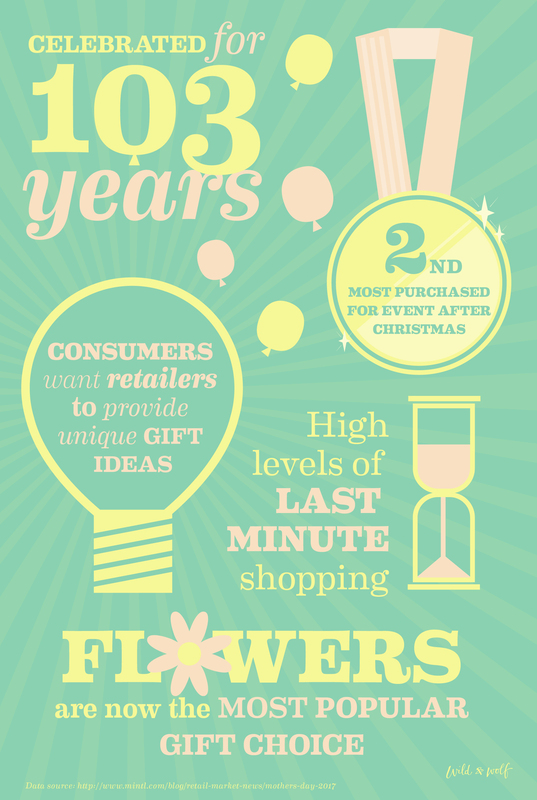 As well as this, research reveals “high levels of last-minute shopping for Mother’s Day”, meaning you need to ensure you have enough stock right up to those final hours! Of course, the challenge goes beyond that for e-commerce: “as people become increasingly accustomed to fast order from online retailers, their tendency to leave gift purchasing until the last minute is likely to rise”. And as such, “retailers offering fast delivery in the final days in the build-up to such events will be the most likely to capitalise”. Stock premium ranges that say, ‘I love you’ like the beautiful Ted Baker Jewellery Boxes, Water Bottles or Pens. Remember, consumers are not just willing to pay a higher price for special occasions; but for a huge proportion of customers it is their preference. To tap into last-minute shopping habits; dress your store (or parts of your store) for convenience/speed buying. We like the idea of creating to “go-to” stand: a stand for those who don’t have the time to peruse your whole store. They just want quality, and they want it quickly. In terms of e-commerce, make Mother’s Day known by creating bespoke banners or merchandise. To discuss how we can help, just email us: press@wildandwolf.com. Notably, online channels are increasingly being used to guide consumers through the gift shopping process. Make it easy for your customers. Make gift recommendations both in-store via window displays or through your merchandising. Similarly, utilise your online presence (if you have one) by creating unique ‘gift guide’ blog posts, emails or social content. Position yourself as an expert in trends and knowledge and provide advice on the best options for your customers this Mother’s Day. Of course, time-limited offers, can help guide consumers in certain directions, too. “Buy X and receive a free X” is one of our favourites. Think like an expert. Sell like an expert!